If you are a crypto-expert in industry, government or academia – we eagerly solicit your careful review. Our primary interest is in determining if the UCF has any remaining fatal weaknesses. We suspect that some small weaknesses will remain, but are confident that these are easily remediated. There is a kind of intro to the genesis of the UCF on this page – and we encourage you to watch a few of the short videos below to get a quick grasp of the essentials. The best way to fully understand what the UCF is, how it works and why it matters – is by an in-person briefing. We’re always happy to arrange a webinar or in-person when that makes sense. Just complete the form below and we’ll get it rolling. 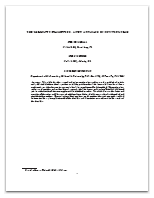 The same research paper is available to the immediate right – just click the image to download the PDF. A whiteboard introduction to the UberCrypt Framework. In this short <4 minute video, we offer a quick overview of the advantages of the Framework. Subsequent videos go into more detail of each advantage. This video introduces the dynamic nature of the UberCrypt Framework one-time key streams. An important element of any cryptosystem is the key stream and its characteristics. How random is it? What is the periodicity? And more. The UCF’s key streams are one-time-use only and of sufficient length that a single key stream could encrypt all the data on the planet billions of times and still not reach the end. Watch the video to learn the details. The UCF has a unique way of allowing users, systems administrators and ISVs to “couple” an encrypted data (file or stream) to a virtually unlimited number of ‘credentials’. This is a ‘quantity’ thing. The more of these ‘couplers’ that are used, the stronger the encryption. In addition, the ‘nature’ or ‘quality’ of these couplers matters too – it’s not just the quantity of them that makes the UCF unique. Watch the video to learn more. Historically, for any given algorithm, an encryption using longer keys (stronger) will run slower than an encryption using shorter keys (less strong). The UCF is unique in that its ciphering speed is constant even though the strength is variable. This is not conjecture – it is an empirically proven fact. Watch the video for a quick explanation on how this is accomplished. There is a recommended standard form of the UCF embodied in our software and our APIs. This enables interoperability of encrypted data across all implementations that adhere to that standard form. However, since the UCF is based on 3D geometry, there is a virtual infinity of non-standard or proprietary forms available. So, for very little effort, it is possible for an organization to have their very own proprietary encryption algorithm that inherits all the benefits of the standard form of the UCF. However, since it is based on a unique and secret 3D geometric form – the challenge to the adversary is increased making the data more secure. This video introduces this concept in more depth. Imagine being able to literally shred bytes while encrypting them and scattering pieces of the encrypted data across multiple files and storing or transmitting those “shards” separately. An adversary must first locate all the shards and gather them into one place before they can even attempt to break the encryption. This is the Split/Zipper functionality available as an option in the UCF. To learn more, watch the short video. If you are curious about how we use 3D geometry to do encryption – watch this video. The UCF tightly couples the 3D geometric form (more precisely – the prime numbers we extract from that form) with a structure made of what we call MIRPs. A MIRP is the Mantissa of the Irrational Root of the Prime from which it came. These three videos explain how we generate a MIRP, how we assemble them into our MIRP Field, and how we process that MIRP Field to generate our key streams. To request a full briefing on the algorithms and associated research, please complete the following request form. Someone will respond within one business day. © Copyright 2014 - Colloid, LLC - All Rights Reserved.